Berne is the capital of Switzerland and is not only a political and diplomatic metropolis but also a very popular and much-visited destination, due to its central, geographical location. Only a stone's throw from Geneva, Zurich and Basel, Berne is an ideal starting point for trips and excursions all over Switzerland. Berne - the romantic capital city! The romantic medieval streets of the city are still a reminder of Berne's glorious past from the 14th to the 16th century. But, even now, Berne has lost none of its former sparkle, for the city's medieval facade, created during that period, still remains largely unchanged today. Stroll along or shop in the city's long, inviting arcades or linger in one of the numerous street cafs. The Zytglockenturm (clock tower), the Munster (cathedral), the bear pit and the breath-taking view from the rose garden are some of the lasting impressions which visitors to Berne can take home with them. Berne also has a number of cultural attractions; plenty of museums, a diverse range of theatrical entertainment and a pulsating night life. 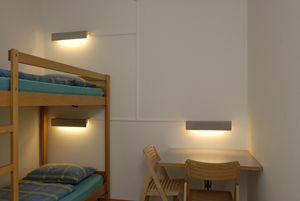 Accommodation:183 beds in total, consisting of two, four, five and six-bed rooms. 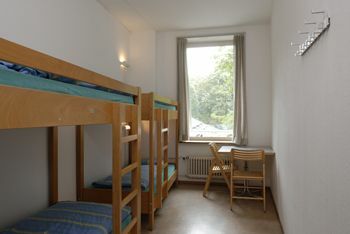 There are also two big dormitories, one with 18 and one with 20 beds. 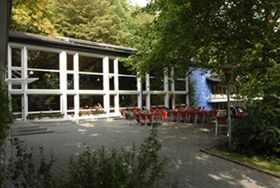 Please note, that all our beds are bunkbeds.Shower and toilets are shared (on each floor)*** Please Note: There is an extra charge for Non-YHA-Members of CHF 6.00 per night, payable on arrival***Reception is open from 7 - 12 am and 2 pm - midnight. Check-in from 2 pm - midnight. Check-out until 10.30 am. By Train: Walk away from train station by passing the church and department store LOEB, then you reach 'Christoffelgasse', 'Bundesgasse', 'Bundesterrasse' (at the Parliament building). Follow the sign posts down the hill or take the cable car (Marzilibahn). On reaching the station at the bottom of the railway line, turn left into the Weihergasse. - The Youth Hostel is the last building on the left-hand side of the Weihergasse. The cable car runs until 9.00 p.m. After 9.00 p.m., bus no. 30 operates from the front of the station forecourt to Marzili, get off at the Dalmaziquai stop.